Researchers from the UCLA Department of Obstetrics and Gynaecology announced today that they have discovered a new type type of stem cell in human adipose (fat) tissue. 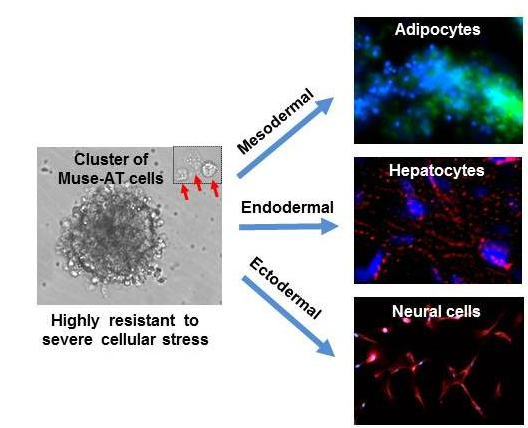 These primitive, stress-resistant stem cells, called Multi-lineage Stress-Enduring (Muse-AT), are pluripotent and have the capacity to differentiate into virtually all kinds of adult cells, without any prior genetic modification, including muscle, bone, fat, cardiac, neuronal and liver cells. The researchers said that they discovered Muse-AT stem cells after a "scientific accident", in which a piece of equipment failed in the lab, killing all the stem cells used in one of their experiments. Further investigation revealed that not all cells had died, instead some had survived the severe stress. Muse-AT stem cells may even be activated by it, said Gregorio Chazenbalk, senior author of the study and associate researcher at the UCLA Obstetrics and Gynaecology. Muse-AT stem cells can be isolated from fat tissue using a standard liposuction, express many embryonic stem cell markers and are pluripotent, meaning that they can differentiate into all the cells and tissues our body is comprised of. Examination of their genetic characteristics, during the two year study, confirmed the specialised functions of Muse-AT, along with their ability to produce or repair tissue when transplanted back into the body. "This population of cells lies dormant in the fat tissue until it is subjected to very harsh conditions. These cells can survive in conditions in which usually only cancer cells can live. Upon further investigation and clinical trials, these cells could prove a revolutionary treatment option for numerous diseases, including heart disease, stroke and for tissue damage and neural regeneration." said Chazenbalk. The researchers explain that purifying and isolating these stem cells is relatively easy and does not require the use of a cell sorter or of any other special, high-tech equipment. They are able to grow either in suspension, forming cell spheres, or as adherent cells, forming cell aggregates very similar to human embryonic stem cell-derived embryoid bodies. "We have been able to isolate these cells using a simple and efficient method that takes about six hours from the time the fat tissue is harvested." said Chazenbalk. Up until now, embryonic stem cells (ESCs) and induced pluripotent stem cells (iPSCs) were the only sources of pluripotent stem cells. Now, researchers have a third option, explained Chazenbalk. "This research offers a new and exciting source of fat stem cells with pluripotent characteristics, as well as a new method for quickly isolating them. These cells also appear to be more primitive than the average fat stem cells, making them potentially superior sources for regenerative medicine." said Chazenbalk. Being easy to produce and pluripotent are not the only advantages of Muse-AT cells. Both ESCs and iPSCs exhibit an uncontrolled capacity for differentiation and proliferation, commonly leading to teratoma and tumour formation. However, previous research by scientists at the Tokohu University, Japan, on Muse-AT stem cells, derived from bone marrow and skin, showed that their use is safe, as they don't produce teratomas, at least not in animal models. Still, the UCLA researchers admit that further research is needed to assess their safety. Chazenbalk finally mentioned that Muse-AT cells may provide us with new insight on cancer stem cells, as they are the only other type of cell ever found to be resistant to such harsh conditions. Chazenbalk and his team now plan to use Muse-AT stem cells in animal models, to examine their efficiency in regenerating damaged or dysfunctional tissues. 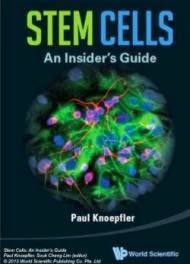 "Because lipoaspiration is a safe and non-invasive procedure and Muse-AT cell isolation requires a simple yet highly efficient purification technique, Muse-AT cells could provide an ideal source of pluripotent-like stem cells.Muse-AT cells have the potential to make a critical impact on the field of regenerative medicine." exract from the study.